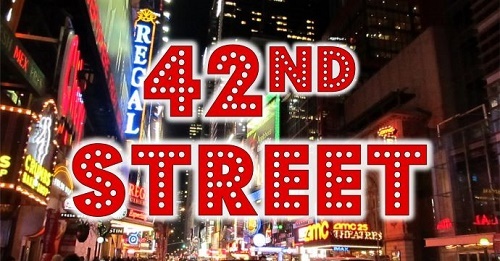 42nd STREET is a big, bold musical set in 1933, that celebrates the stuff that dreams are made of. The curtain rises on Andy Lee, the dance director who is auditioning kids for the chorus of ‘Pretty Lady’-Audition. The show’s writers, Bert and Maggie, are pleased with what they see on stage, but they warn the dancers that at $4.40 per seat, the audience will demand some spectacular dancing. While she has gathered up her courage for an hour at the stage door, young Peggy Sawyer has missed the audition. Billy, the romantic lead, tries to help her see the producer-Young and Healthy. Just then Dorothy and Abner arrive. Dorothy gushes to Julian that she has “dreamed of the day when I might work with the King of Broadway.” Nevertheless, the “king” will not be pushed around, and Julian suggests that Dorothy audition. Abner defends Dorothy and reminds Julian that Dorothy does not have to try out for anyone-Shadow Waltz. Realizing that she has forgotten her purse, Peggy returns to the stage. Maggie invites her to lunch with three of the girls. The five dance off stage. As they settle in at the Gypsy Tea Kettle, the girls are amused by Peggy’s naïvete. They follow with an amusing account of the Broadway facts of life, and dance back to the theater-Go into Your Dance. This number evolves into an audition for Peggy. When Julian walks in he is angry to see Peggy disrupting things again, but he is struck by her remarkable talent. He orders everyone back to work and tells Andy to hire Peggy for the chorus. Dorothy and Billy begin their rehearsals. The love scene they are rushing through comes under the scrutiny of Abner. He objects to it and handshakes are substituted for kisses-You’re Getting to be a Habit With Me. Word arrives that the Atlantic City run of the show has been cancelled and that Philadelphia has been substituted. The company packs up for the Arch Street Theatre-Getting Out of Town. Dress rehearsals begin in Philadelphia-Dames. Julian congratulates the kids on a number well done and sends the cast off to relax. Act II opens with a doctor telling Julian that Dorothy’s ankle is broken. Fear and panic spread through the cast. Julian says he will close ‘Pretty Lady’ for good, but the cast won’t give up-Sunny Side to Every Situation. The cast thinks that Peggy can save the day. Julian finally agrees that Peggy might be able to take over for Dorothy. Peggy has already left for the train station and Julian rushes after her. Julian convinces Peggy to return-Lullabye of Broadway.